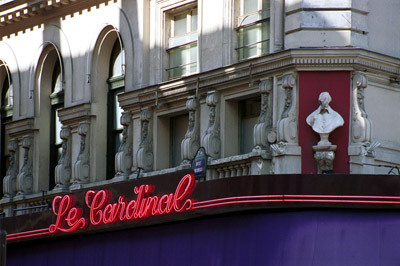 At the far end of the rue de Richelieu, on the corner with the Boulevard des Italiens, the Café Le Cardinal (called after Cardinal Richelieu, whose bust is displayed on the outside) was one of the places frequented by Berlioz from an early date, and he alludes to it several times. He mentions in his Memoirs (ch. 18) how in winter 1827-8 the shock he experienced on discovering Shakespeare made him wander aimlessly for hours on end through the streets of Paris and in the neighbouring plains, until he would drop asleep through sheer exhaustion – one such occasion was at the ‘Café du Cardinal ... where I slept for five hours, to the great alarm of the waiters who did not dare to come near me for fear of finding me dead’. 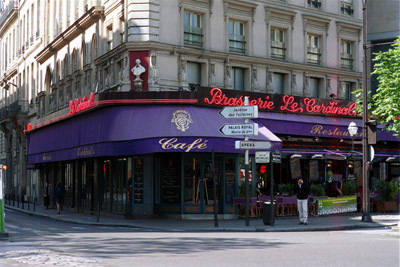 The Café is mentioned several times in the composer’s correspondence. 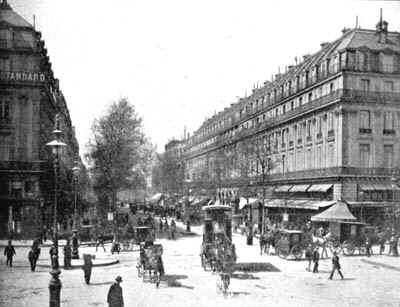 A letter to his friend Humbert Ferrand dated 29 June 1829, two days before Berlioz entered the competition at the Institut for the Prix de Rome, was written at a table of the Café near the Boulevard des Italiens (Correspondance générale, no. 130; hereafter CG for short). Later, in a letter of 17 February 1851 Berlioz writes to a friend, Ferdinand Hiller, suggesting they meet at the Café du Cardinal (CG no. 1384; the letter is in the selection edited by Hugh Macdonald, no. 254). In a letter of 19 December 1852 to his friend Auguste Morel Berlioz says he often looks for him at the Café du Cardinal and wonders why he is not there for lunch (CG no. 1542). And in 1865, in a letter to his son Louis dated 11 July, he relates that the day before he met there the Irish composer Balfe and they had dinner together (CG no. 3025). All the modern photographs reproduced on this page were taken by Michel Austin; the old photo is in our own collection. © Monir Tayeb and Michel Austin. All rights of reproduction reserved. The flat at no. 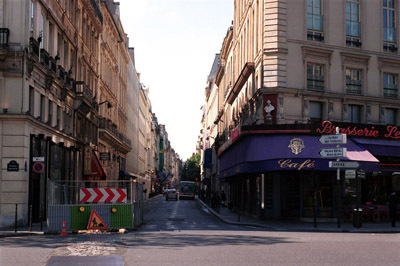 96 occupied by Berlioz in 1828-1830 is a few hundred yards away, on the left side. This picture has been scanned from John L. Stoddards Lectures, Volume V – Paris La Belle France and Spain, by John L. Stoddard (Balch Brothers, 1898).